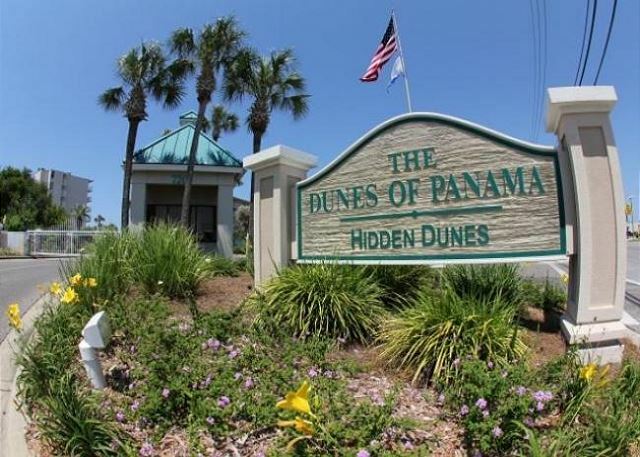 Welcome to our Dunes of Panama condo! Small under 25 lbs. and well behaved pets welcomed. 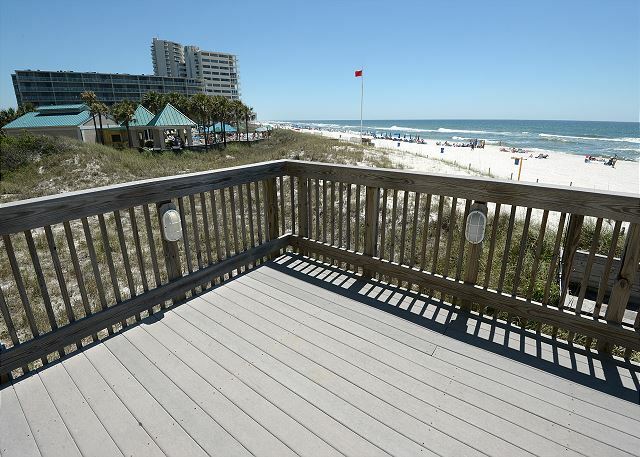 Our second floor condo is a 2 bedroom / 2 bath unit (A-206) is a spacious condo with fantastic views of the Gulf from the living room & master bedroom - perfect for watching dolphins and beautiful Gulf of Mexico. Living Room has a Brand new Commercial grade sofa sleeper. 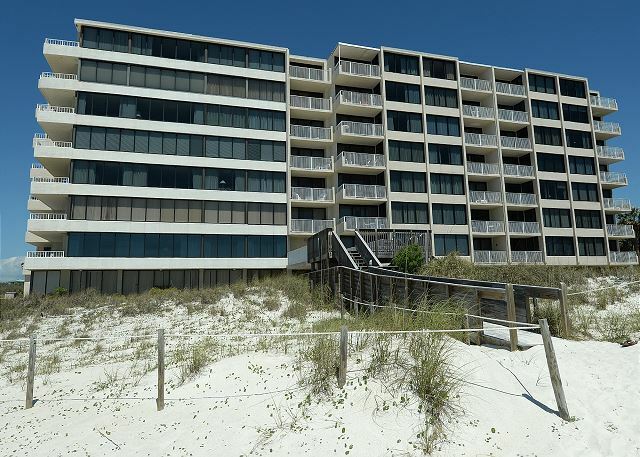 large flat screen TV with balcony overlooking the Gulf.. There is seating for three at the Breakfast bar and dining table set that seats 4. 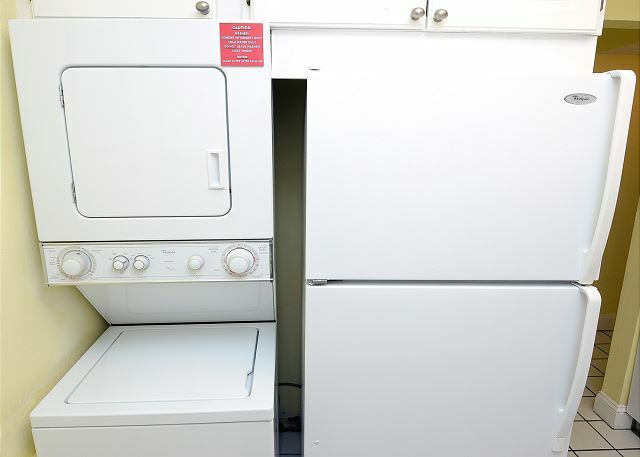 Our condo has a washer-dryer for your convenience. Located on the second floor close to the elevator. Overall satisfied with our recent stay at Dunes of Panama. Room had a nice layout but could use a remodel. My wife and I stayed 2 weeks at the Dunes of Panama Building A 206 in March 2019. WiFi access was unsecured and intermittent . TV viewing .. also provide instructions for HVAC / wall mounted Honeywell thermostat . Upon arrival, thermostat was set on cool ..so initially condo was cold . I am familiar with this model thermostat and reset to heat cycle to warm place up. Some folks are not likely to know how to reset thermostat .. provide instructions . 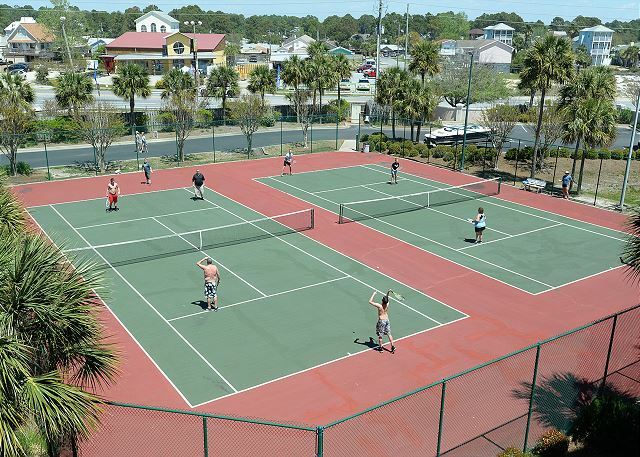 Nice facility and nice location centrally-located. Well maintained with multiple nice features including three pools to select from. Specific unit was beachfront and made for a nice vacation. 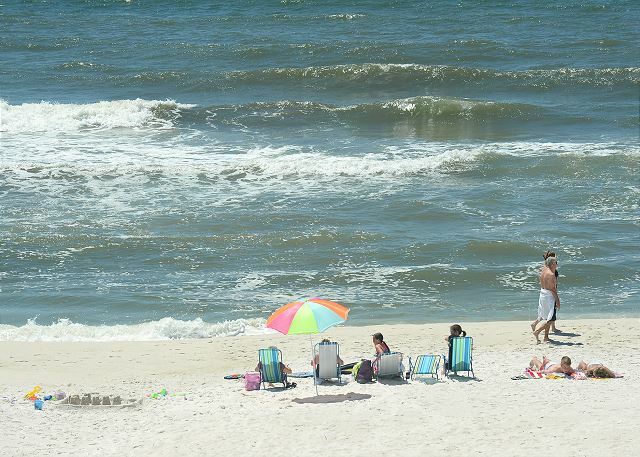 Looking forward to next vacation in Panama Beach. I ask that there be a few more skillets in the kitchen as I tried to cook with only one skillet. We had a great rental experience and the condo fit what we needed. The only think I found that we needed were more cooking utensils and some cookware. It was a great place and we loved our time there. Thanks so much for renting to us! We will be back! I'm not one to really complain. I loved the location of the condo, but other than that the condo wasn't in the best condition, but was clean upon arrival. The bathroom wall had a giant hole in the wall where they cut it to put in a sliding door. That hole wasn't patched, but covered with a towel. The carpet is very old and semi gross. On the balcony the paint is peeling off. Also, for two days I the light in the kitchen was brought, and there is no other source of light. I had to cook breakfast by faith, and not by sight. It was good week, the cleanliness rate as 6, the master bathroom had a huge hole in the wall and a towel screwed in the wall to hide the hole, a light bulb needs to be replaced, it was blown out. The bedroom night stand drawers are messed up they don't open good and dresser and night stands needs to be painted, and carpet needs to be replaced.The 2nd bathroom shower has to much water pressure maybe shower head needs to be replaced, it hurts to take a the kitchen the garbage disposal sounds like it has metal in it. My family and I had a wonderful vacation, this condo suited all our needs perfectly. The kitchen is well supplied, the rooms and closets are spacious, everything was tidy and very clean. 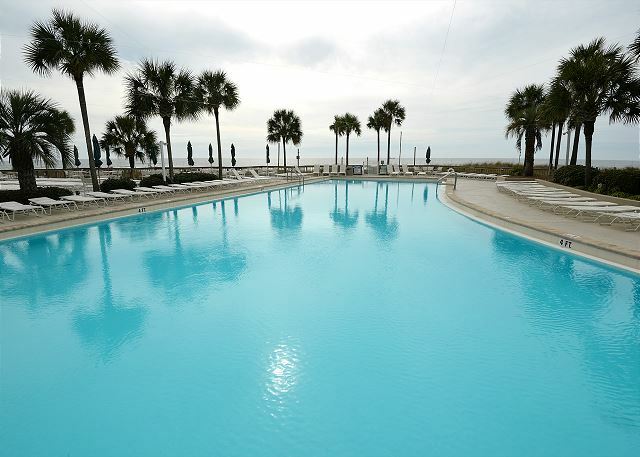 We loved the pools and pet walk areas.This is an excellent location, plenty of free parking, beautiful view...4 Star Realty was a pleasure to deal with. Loved the location and proximity to the beach. However, be aware that this particular condo is pretty old and dated and needs some TLC and a thorough cleaning!! It's pretty tight quarters especially in the kitchen and there's only a shower in the "master bath". We had some issue with smokers above us on the balcony and apparently the onsite rental office has no idea when condos are rented by Home Away or other companies. We had men walk right into our unit to "turn off our water". I'm glad we were there and when we spoke to the downstairs office they said they had no idea anyone was in the unit so they told them to go right in. It did concern me that anyone could walk in without even a knock. It might be better to book directly with the condo if this type of miscommunication happens. It is difficult to write this review as there is no denying that the location of this condo was beautiful! 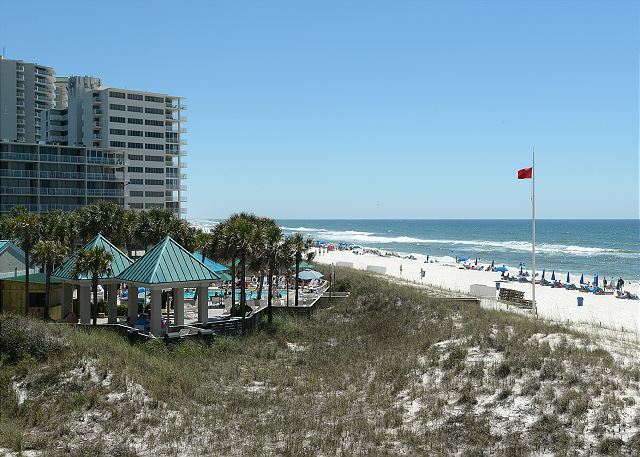 Right on the Gulf and we had a balcony overlooking the beach and there were nice Gulf views from just about all rooms. However, future visitors should be aware that Panama City sits at the eastern edge of the central time zone and, as such, it gets dark early here in the evening. Unfortunately that is where our high praise ends. When we arrrived a smoke detector was beeping and when attempts to change the battery failed ( the detector itself turned out to be faulty) we had to put up with it beeping all night as the rental office was closed for the day. Our other disappointment was how dated and cluttered the rental was. It is desperately in need of cleaning out. The closets were full of an old tube TV, a snow fence, large picture frames, paint cans, construction debris, an old metal cabinet , three old non working land line phones, many old phone books, and several heavy blankets. The kitchen cupboards were overfilled with too many dishes, three hand mixers and two of three drawers were filled with utensils- not suitable for a month-long rental as there was a general lack of storage in the kitchen. When we called management about the smoke detector and clutter they did come the next day and remove some of the debris and fixed the smoke detector.We were also a little surprised that there was not am list of instructions on, for lack of a better phrase, "day-to-day living" things- items such as trash procedure, recyclable disposal, nearby essential services such as emergency services, etc. And finally, I did discover that we could have saved quite a bit on our stay had I dealt directly with the condo management office of the complex and not Four Star Condo Services. So, while we did enjoy getting away for the month, I really cannot say that I would recommend the Dunes of Panama to future vacationers. The condo is nice and well appointed. Master bedroom mattress is awesome. Slept like a baby. Views are fantastic. Furniture in living room was comfy. The master bath needs some serious attention. The ceiling over the shower stall is coming down. The door on the bathroom is horrible. Also, the kitchen sink faucet has some sort of issue. No matter which side of the sink you turn it, it goes back to the same place.? I will say, we've been going down to PCB for 22 years, and this condo had the best sliding doors. Usually can hardly open and close them. These worked great. Also the carpet in the master bedroom needs replaced. It's pretty stained up. Would I stay here again?? Yes but that bathroom would have to be redone. the best yet we come to pcb every year in oct. this condo was one of the best ones i have stayed in. four star condo was an excellent management company. Dunes of Panama is a great place to stay. Have stayed at other locations and was disappointed at how out dated the room was and when we had an issue it took 2days to get resolved. Loved the location of the rental. For the money spent on the room I could have stayed at a much nicer resort . Great location, Okay rooms, Bathrooms need help! Needs some work. The shower ceiling was falling into the shower, as you showered. The master toilet/shower had a pocket door. No room to even try and slide the door to shut. Never could get it all the way shut. Fridge took a full day to cool, I thought it was broke. Maintenance quickly supplied us with a large cooler and ice to protect foods. Painting the balcony rails would go a LONG way. right now rusty and looking run down. New paint would give a much better impression. room was as good as the pictures show. The only disappointment is the bathrooms. We are not ones to stay in our room but to sleep and shower. The room was fine for our needs. I personally will look next time for bathrooms with more room and doors that lock. This condo has a fantastic View. In general the condo was good but showed wear. Chipped Cabinets, chipped sink and the master shower was small. The outside table was rusted. Outside chairs were great. The property mgmt company forgot to tell us that wifi had recently been changed so we had wrong info. Pool and beach were great. Our condo was spacious, decorated, came with a washer/dryer that was very handy, clean. Everything was SO GOOD we are thinking we may just spend the holidays here. We were within steps of the beach and pool and it wasn't noisy at all. Looking forward to our next trip. The condo was spacious and well appointed. Washer/Dryer was a much used asset. Central air was a perk. Well appointed kitchen, including ice maker, was greatly appreciated. Views of the beach and pool were more than we bargained for. Sweet staff at the home office made everything easy for us. Parking was a dream. This was our first vacation with the dogs. Plenty of areas to walk the dogs. Nice place and location. The view is amazing. The kitchen is small (for my taste) for a two bedroom but it is very workable for one person at a time. The unit has a beautiful view although the balcony is crowded with the large table, two small tables and six chairs. We had to stack the chairs to get them out of the way. This is away from the pool if you are not interested in the noise. 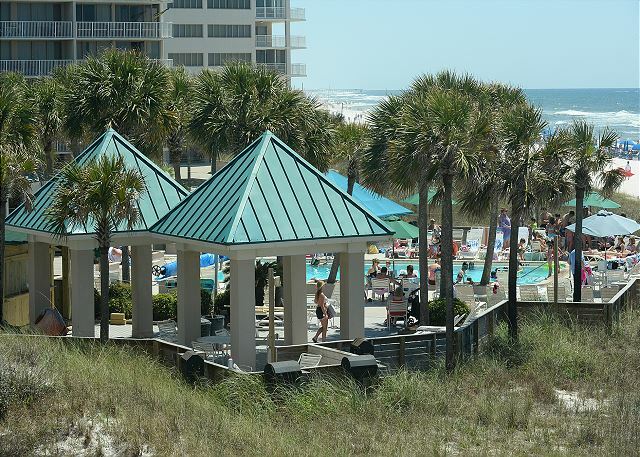 It is above the walkway that goes to the beach and pool. They were replacing the walkway to the closest pool which was under renovation. The master has non opening windows that look out to the ocean as well a balcony door. The unit was ready when stated, it was clean and had everything that was listed. We had a wonderful time and would stay again. This unit is close to the elevator and trash chute. 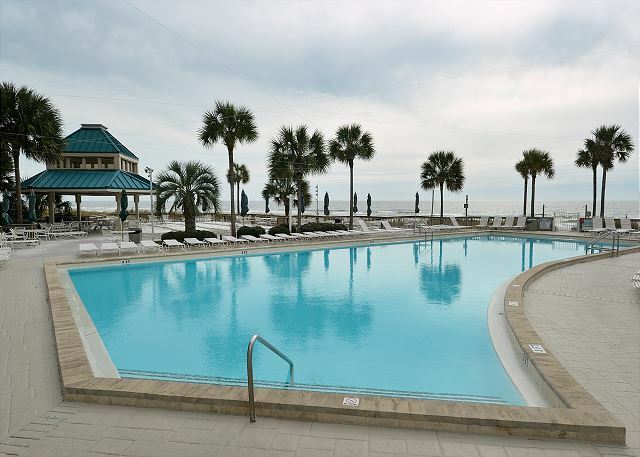 You only have to go down one floor to get access to the beach and pool walkways. It stated it sleeps 8 but you would have to put three in the King to sleep more than 7. The condo has potential but in need of a thorough cleaning, maintenance, and painting. Both shower head has mold in them and the tub had mold and leaked. Several times during our stay water would pour from the ceiling vent in the bathroom. No problems everything went as well as could be expected. Everything we were looking for!